I sure am trying to diet and i am! Didn't you know that Diet is a 4 letter word? I think the PC name for it is 'life style change'. Or perhaps Way of Eatting (WOE) or WOL (meaning life). So, perhaps I should now answer the quickie... Ummm officially no. But I am involved in a WOE/WOL. i know u know the answer skitts... but due to the GOrgeous weather I feel so bad about being MIA for so long from my friends blogs so i wanted to pop in and say HI and I miss u! Yes, I am. I was on NutriSystem last month and after spending $300 and only losing 12 pounds, I gave it up! I can do better than that on my own! I've lost 17 pounds. 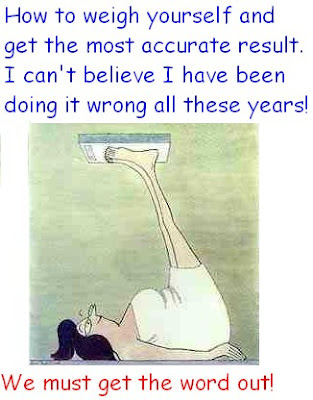 Always but I will try that new way of checking my weight!